"This barbarian, this man of the Iron Wastes, was known only as Nanok. Rumored to have been raised by wolves, Nanok thrived and grew among the giant, rusted bones and shattered crystal tears of a long-forgotten empire. 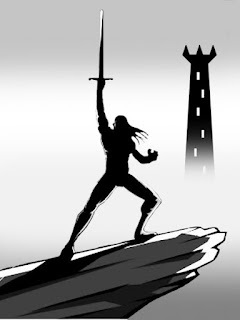 Now, Nanok lived the life of a wanderer and sell-sword, reaver and pirate, thief and gladiator. A drinker of ale, a lover of women, and a slayer of men...usually - but not always - in that order." 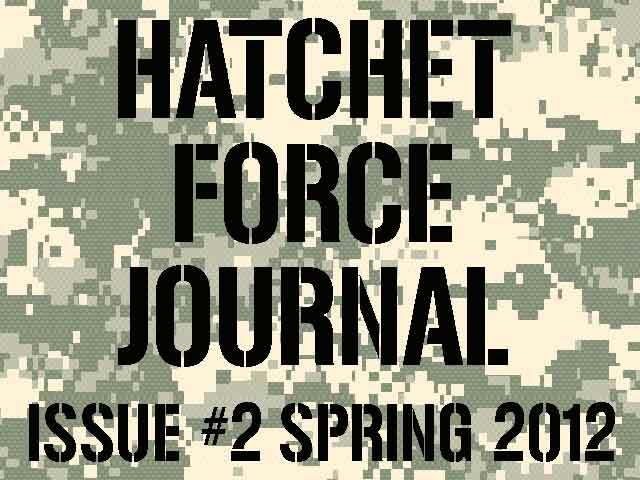 The people have spoken, and the people want another issue of Hatchet Force Journal. I received a lot of great feedback about the first issue, and I'm hoping to incorporate much of it into the release of issue #2. I don't think I'll be able to accommodate everyone's wishes, but I'll do my best to make #2 a lot better than the first issue, which even I'll admit was a bit of a hot mess (although hey, people are still buying and borrowing it). Length: Between 1,000 and 1,500 words. If you color outside the lines a little bit that's fine, but I'm trying to cut down on the size of the articles - that was one of the main complaints I received about the first issue. 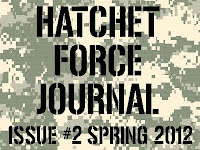 Topic: Issue #2 has a theme! "21st Century Combat". This can be combat operations, counter-terror, law enforcement, mercenaries, what have you. But we're focusing on the 21st century, post 9/11 world view. Keep it Politically Neutral. If you want to talk about private security company operations in Iraq that's fine, but if you want to turn it into an article about the privatization of the American military, I won't accept it. Pictures encouraged. Since it'll be released on the Kindle, pick something that'll look half-decent in black and white. I may have to play around with it in Photoshop to make it pop a little, but otherwise I won't alter anything other than file size etc. Fiction and Non-Fiction Reviews/Articles Welcome. HFJ is about action and adventure stories in all forms; television, film, books, video games, real-world reference articles, excerpts - all is fair game as long as it's on-topic. I'm looking for ~12 submissions, and I'm hoping to get them all in by March 9th. I'm aiming for a release date in the beginning of April. If anyone is interested in submitting an article, feel free to e-mail me (j dot e dot badelaire at gmail dot com). Over at my other "main" blog, Tankards & Broadswords, I posted a lengthy post-mortem of my experience at the Boskone 49 Science Fiction convention here in Boston this past weekend. If your'e a fan of Sci-Fi fiction, especially a good blend of classic and new media, and live in the New England area (or can get to Boston relatively easily) I highly recommend attending some time. I don't really understand what Barnes and Noble is doing here. You're making independent authors choose which platform to go with, and I think it is pretty clear that unless they are rabid anti-Amazon fantatics, they are going to go with the bookseller with the biggest piece of the market - Amazon. The fact that they will not sell books distributed from venues like Smashwords (because SW distributes you to Amazon et al) shows that this isn't necessarily an Anti-Amazon tactic, but an attempt to draw a line in the sand. Well, here's a bit of advice. Don't draw a line in the sand unless you're fully prepared to deal with someone stepping over that line. As we just saw with Borders, even "big" booksellers can be toppled with just a little leverage, and Barnes and Noble isn't as big as it once was. If indie authors (whose books are selling more and more volume every year) shift en masse to Amazon, or really just boycott B&N, I wonder how long B&N can hope to hold out? Not very long at all, is my guess. Paranoid About Government Micro-Robots Watching You? When Lee Goldberg sent this out, I stopped reading the novel currently sitting at the forefront of my kindle, transferred the file over, and dived right in. Goldberg wants McGrave to be the sort of fast-paced, delicious junk food action story that guys like me read on our lunch breaks or while we're sitting glumly at 8 AM on the subway or commuter rail. I started reading this zany cop action smorgasbord over lunch, with a big greasy burrito and a bottle of cheap beer, and found myself a good fifteen minutes late back to work because I couldn't put them damn thing down. McGrave is that perfect blend of action, humor, gratuitous violence and ludicrous hyperbole that fueled so much of my adolescent reading materi...oh, who am I kidding? It's still the bread and butter of the printed pages I read. Goldberg mentions at the end of the book that McGrave was originally a script for a television pilot, and you can absolutely see that. It is intentionally written in a "televised" style, focusing almost exclusively on what the mind's eye sees and hears as you read through the story. No deep introspection, no long discussion of the finer points of human nature. This book is the literary equivalent of buffalo wings and boilermakers. So, if you like cop action thrillers where the good guys punch first and ask questions later, where every time the good guy walks back into the police station the Captain's blood pressure shoots through the roof, and every time he walks back out the city's civic repairs budget takes another big hit, McGrave is your new favorite ebook.